Small - $129.99 Only 2 left! Medium - $129.99 Only 6 left! Large - $129.99 Only 4 left! Yo ho-ho, ye scallywags and old salts! Ah, the Golden Age of Piracy. There were some pretty famous rogues sailing the high seas as pirates back then, searching for treasure and looting the rich. You’ve heard of these guys. Captain Kidd and his legendary buried treasure. Black Sam Bellamy, called the “Robin Hood of pirates, because if you steal from the rich and give your booty to the poor, it’s all good, right? The notorious Blackbeard and his ship the Queen Anne’s Revenge, which sounds like a totally serious rig. So, what about the women pirates? Yes, there really were women pirates! They just haven’t gotten their fair share of attention. Like Anne Bonny and Mary Reed, who did their fair share of swashbuckling and treasure hunting, too. They got into the piracy biz by dressing up in boys’ clothing for most of their lives. How sad for them, because they could have been wearing something like this bad-in-a-very-good-way Deluxe Colonial Pirate Costume – for women. 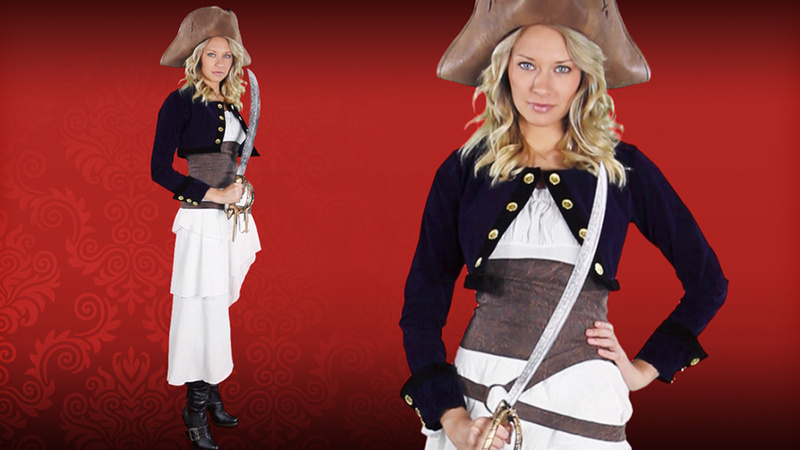 But you, however, can board this year’s Halloween ship in high seas style by putting on these lady buccaneer. The pirate costume has everything you need except the boots and the battleship. The white peasant-style dress is layered to catch the sea breezes and has a faux leather waist cincher to show off your shape. The velvety short jacket has ornamental buttons and the tri-corner pirate hat shades your eyes from the glare off the water. Just pick up the cool plastic sword and you’re ready to board ship and get your booty!